When filmmakers talk, especially when cinematographers and directors talk, they often talk in influences on themselves and for the work. A good way to make sure everyone is on the same page for a project is to create a mood-board for the project. As you can pin video, stills and audio Pinterest is the perfect place to create and share this. If you want to be a dictator, create a board, and then make your minions view it. If you want a more democratic process, you can let everyone on the team have a say and contribute. Pin links to movies that have some influence on what you’re trying to achieve. Link to actors who would be your ideal for a role. Link to costume, set, soundtrack, prop and location ideas. Break things out into separate boards if a single board gets overcrowded – no one wants to wade through more than a 100 pins so make it easy for your cast, crew and collaborators to find what they need. I used to bookmark pages I thought might be useful but them I could never find what I wanted in my mess of bookmarks spread across three different browsers on many different machines and devices. Chances are, if you’re a video producer, you’re a visual person, so what better way to store those useful links than on a Pinterest board? If it works for wannabe interior designs it will work for wannabe filmmakers too. Collect examples or what not to do if you’re so inclined. There are plenty of boards where other users collect DIY projects for filmmakers. Others share collections of Filmmaking gear and tools if you don’t have enough gear-lust already. Yes, you can just Google these subjects but the visual responses to your queries in Pinterest are a more pleasant way to browse results, especially if you don’t know exactly what you’re looking for. … but not too much. If every pin you make links back to your own store or blog you wont get many followers. Why follow you on Pinterest when you can just go to your blog for the same content? Be more generous in your pinning but there’s still room for a board that is dedicated to your own work. If people want to know more about you they can see some of what you’ve made in a dedicated board. It’s also an easy way to create a portfolio you can point people to, especially if your work is spread across different hosts, channels and accounts. Looking through someone’s Pinterest Boards, you get a sense of who they are through what they like and promote. Do I want to work with this person? Is this person just promoting their own projects or products or are they being generous with their pins? Are they just following the herd and repinning the same stuff as everyone else or are they using Pinterest in their own way? What movies do they like? Which people do they admire? When you’re looking to work with someone new, you want to know as much about them as you can find. You might be working with them 24×7 for the next 6 months. Yes, it’s important that they can do the job but it’s also important that you can stand to be with them in close proximity for that long. Pinterest is a tool that can help you make that decision: it tells you something about a person beyond their IMDB entry or on-line portfolio. And while you’re considering that, what do your pins and boards say about you? You should probably check into that before you apply for next gig because they’re going to Google you before they offer you the job. 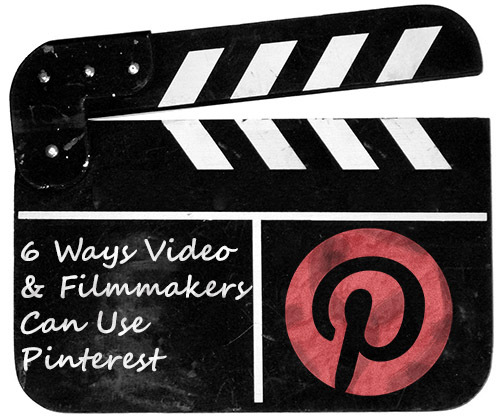 The community of filmmakers on Pinterest isn’t large but it is useful and inspiring. Find and follow boards and pinners who trigger ideas when you’re browsing Pinterest over your morning coffee. Comment on, or re-pin, or favorite pins you like: the social aspect of Pinterest is not as interactive as Facebook or Twitter but you never know who you’ll bump into on the site.